Consistent action builds extraordinary outcomes. 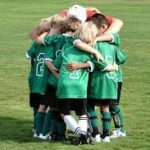 Youth coaches are often asked: “What are your primary goals for your players this season?” Common answers are: “Stay Safe”, “Have Fun”, and “Win Games”, and those are perfectly reasonable replies. Those wouldn’t be my answers, though, because I don’t coach in those terms, explicitly. I of course share those wishes but I don’t consider any of them to be specifically actionable, so I don’t spend much time talking or worrying about them. Instead, I trust them to be outcomes of my primary coaching pursuit: maximum success. So I stay mostly concerned with instructing success and correctness. I stress maximum success – the ability to do something correctly – with everything I teach a young player. Everything. There is a correct way to dress for practice, a correct way to help carry team gear from my car to the field, a correct way to unpack the gear for practice. A correct way to warm up, to treat team mates, to respect game officials, to run on and off the field. And so on. There is a correct way to throw, catch, run, hit, kick, shoot, tackle. And there are several different correct ways to do these basic skills, depending on the situation. I teach the correct method and expect players to pursue maximum success in everything they do. Admittedly, it’s easier said than done, it’s a lot to ask of young players, and it would require years for a volunteer coach to (first learn and then) teach everything correctly. But it’s a commitment to this philosophical ideal and a loyalty to this approach that form my guiding coaching ethic. And what eventually results from this singular pursuit? Players learn to stay safe, players have more fun doing things correctly, and players enjoy victories in some form or another. Indeed, those other commonly stated goals are attained after all, but they are derived naturally. Most importantly, players keep playing the sport, giving coaches more time to continue supporting them with this pursuit. So when I’m asked what my season goal is, my answer is simple, and the same every year: maximum success in everything. And when I get down about a team injury, a dejected player, or a tough loss I return to this guiding ethic to get the coach in me back on track. How do I measure my attainment level? Lack of injuries, happy players, wins . . . sure. But I also watch for and celebrate more subtle victories: better technique, better decision-making, better resilience. I also see if all my former players return the following season to the sport. Are they recognized by future coaches as being well-coached? Do they become future team leaders? Did my instructional investment pay off for them? My players have a lot of fun. But I never tell my players to have fun. It’s not an actionable instruction. When a player hears that, it means nothing. It’s probably being ignored. At best, the player thinks, “OK, sounds great. But how do I do that? Show me something fun!” There is nothing wrong with stating a desire to have fun, except when it stops there — or worse, when it’s followed by instructions to do something that isn’t fun (like standing in line while one team mate has all the fun). Kids then stand in line and start goofing around, since the coach told them to have fun. The frustrated coach then reprimands them for goofing around; alas, for having fun. So be careful what you ask for. Instead of trying to coach fun, try coaching success. Success is fun, so coach success. A youth coach is a teacher. Practices are lessons and should be used to teach. If you can head to every practice able to state to yourself exactly what you plan to teach that day, you will have happy players having fun and getting better. If they’re not having fun, it may just be that they are not learning enough. What are your goals for your team this season? How do you communicate them and how do you measure attainment of those goals?